Who Is Liable if a Motorcycle Hits My Car? If you are a daily commuter in California, you’re accustomed to sharing the roads with motorcyclists. Chances are, you’ve probably seen a biker veering between vehicles during periods of heavy traffic – a practice known as lane splitting. Many motorists dislike motorcyclists zigzagging through the lanes, which can increase the odds of an accident, especially when they are traveling at high speeds. While imprudent lane splitting is prime fodder for a collision, there are many factors that can cause a motorcycle and vehicle accident, which raises the question of who is liable if a motorcycle hits your car. Liability in such situations will hinge upon the events leading up to the accident and concrete evidence that establishes the cause of the collision. 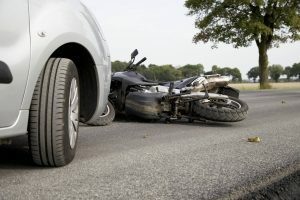 If you were recently hit by a motorcyclist, it’s in your best interest to consult with a reputable personal injury lawyer who has considerable experience litigating motorcycle accident claims with success in California courts. According to the Hurt Report on motorcycle safety, motorcycle rider error is responsible in roughly two-thirds of cases in the single vehicle accidents studied. One of the most common errors is known as slide-out, when the biker over brakes and falls off the motorcycle. Other errors include under-cornering and taking a curve too wide because of excess speed. All of these scenarios can cause a motorcyclist to lose stability, traction and control of their bike, and leave them open to liability in the event of an accident. There are some accidents where culpability is not clear cut. Perhaps bad weather or the presence of road debris are in dispute. In these types of incidents, eyewitness statements can be invaluable, and your legal counsel will be certain to contact any individual who witnessed the crash and can lend credence to your case. Third party witnesses who write statements or provide testimony under oath are compelling assets for the plaintiff. These witnesses have no vested interest in either party, and can help the police, the courts and insurance carriers establish fault. If a witness sees a biker driving erratically, riding on the shoulder, or dangerously weaving between lanes at high speeds before striking your car, you will likely have a solid claim for damages. In Los Angeles as well as the rest of California, lane splitting is legal, although research from UC Berkeley’s Safe Transportation Research & Education Center found that almost 18 percent of 6,000 motorcycle accidents between 2012 and 2013 involved bikers who were lane splitting at the time of the accident. The study found that lane splitting bikers were more likely to be on the roads during peak commute hours and weekdays. While California law allows for lane splitting, it must be done in a cautious and prudent manner that does not jeopardize the safety of others. If you are hit by a lane splitting motorcyclist, chances are the insurance company will take a hard look at the police report to see if the motorcycle rider’s careless actions contributed to the crash. Reckless speeding, driving while under the influence and distracted driving are all factors that will help determine which party is to blame for the wreck. Traffic violations, road defects and weather conditions may also play into which party is at fault. As the driver of the vehicle, you may be found wholly or partially responsible if you opened your car door on an oncoming motorcyclist, or if you turned left into the path of a motorcycle rider without yielding the right of way. Intersections are some of the most common sites for motorcycle-vehicle collisions, and – under California law – it is the driver’s duty to slow down when seeing a yellow light and stop completely at a red. Though there is no law that forbids being in the middle of an intersection at a yellow light, liability issues get more complicated if an accident occurs at this very moment. This is when having skilled Los Angeles car accident attorneys is especially helpful. As useful as police reports and witnesses are in determining liability, it is up to your legal counsel to investigate, document and gather pertinent evidence that backs up a claim for damages. An established personal injury law firm like Ellis Law Corporation has an in-house network of industry professionals, from medical experts to crash recontructionists and economic planners. When a motorcycle hits your car, you need effective legal guidance from one of our Los Angeles personal injury lawyers who gets results and is not afraid to take on complex cases. Call Ellis Injury Law for a private consultation free of charge today.